Written by Winfield Bevins from The Resurgence. Lent is a traditional time for Christians to draw closer to Jesus through prayer, reflection, fasting, and repentance. Here are a few simple ideas for keeping this ancient Christian observance. Lent is a season of spiritual preparation in which we remember Christ’s temptation, suffering, and death. Historically, the church has celebrated Lent as a 40-day period beginning on Ash Wednesday and concluding the day before Easter. The climax of Lent is Holy Week, which is the week immediately preceding Easter, or Resurrection Sunday. It is observed in many Christian churches as a time to commemorate the last week of Jesus’ life, his suffering (Passion), and his death, through various observances and services of worship. Lent is a season of spiritual preparation in which we remember Christ’s temptation, suffering, and death. Many Christians use the 40 days of Lent as time to draw closer to the Lord through prayer, fasting, repentance, and self-denial. “What are you doing for Lent?” is a common question among Christians this time of the year. With Ash Wednesday upon us, perhaps you are beginning to think and pray about how you will spend your time during the sacrificial season of Lent. 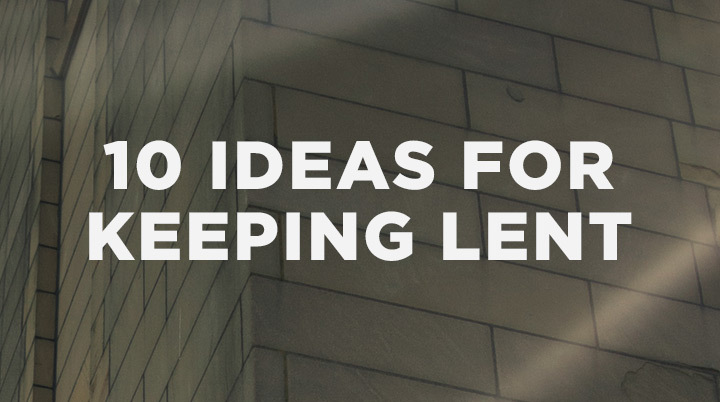 Here is a list of 10 ideas for keeping Lent. Reflect daily on the power of the gospel of Jesus Christ, the meaning of his death on the cross, and the greatness of God’s love for you. Set aside some extra time each day for personal prayer in the morning and evening. Make time every day to read your Bible. One idea is to read the entire Gospel of Mark, which has a special focus on the cross. The climax of Lent is Holy Week, which is the week immediately preceding Easter, or Resurrection Sunday. A common practice for Lent is to give up something—like technology, social media, sweets, coffee, alcohol, etc. This is a great time to detox from things that may have a stronghold in your life. In addition to giving something up, try doing something good this Lent. Are you a pessimist? Try to be more positive. Are you critical by nature? Make an effort to be more encouraging. Ask the Holy Spirit to help you. Give of your time by volunteering in your church or local community. Keeping a journal of your thoughts, prayers, and reflections during Lent can be a helpful aid to your Lenten journey. If you have kids, plan special times just for them during Lent. Take your family hiking or on a lunch date, or even have a family day where you can serve together in the community. During Lent, give a little more money to your local church or consider your favorite charity. Is there a person in your life you you need to forgive? Don’t hold that resentment any longer. Pray about it and ask God to help you forgive them.